People think it matters who occupies that house. It doesn’t. Multinational corporations and criminals run the world. Recently, I attended the 2013 Film and History Conference in Madison, Wisconsin. I presented a paper on the Dr. Mabuse series produced in Germany by Artur Brauner. 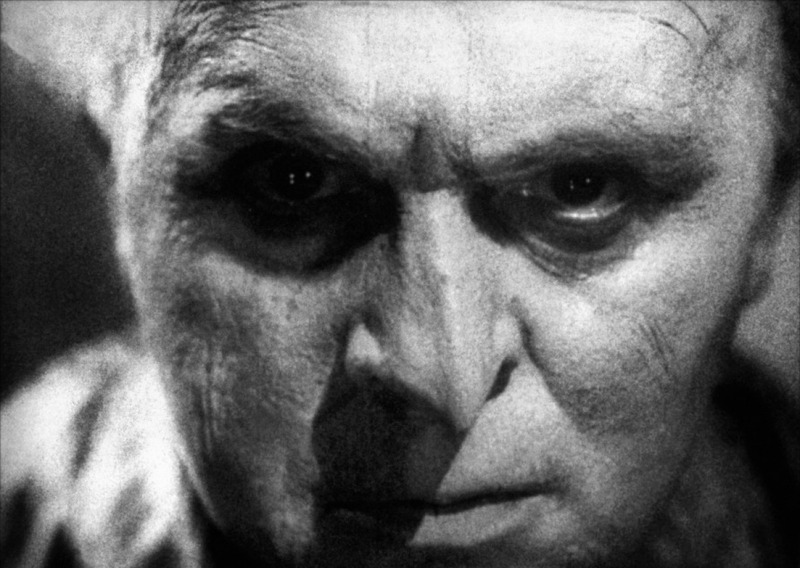 This series started with The Thousand Eyes of Dr. Mabuse (1960), the last film directed by Fritz Lang, but continued on for some 5 sequels, most heavily imbued with Langian aesthetics as if to compensate for the absence of Lang himself behind the camera. Though that series came to an (ignominious) end in 1964 (with The Death Ray of Dr. Mabuse, perhaps the most boring imaginable film to have such a promising title, and a total capitulation to the Bond phenomenon), the character did not entirely disappear. In The Strange Case of Dr. Mabuse, David Kalat identifies Scream and Scream Again (1970) as a kind of quasi-Mabuse film, and in 1990, Claude Chabrol’s Dr. M updated Mabuse in an overtly science-fictional context (whereas SF elements had been present in Brauner’s series only in the same sense as in early Bond films). In the q&a following the panel, I was asked if there were any plans to resuscitate Herr Doktor M., and I replied that I didn’t know of any. Then, about a week later, I first saw the pilot of The Blacklist, the main character of which immediately struck me as perhaps the most Mabuse-ian character in recent memory. That’s when I decided to write a blog on Mabuse and his family tree. The idea of the supervillain, the Evil Genius who controls events from behind a mask, an alterego, or simply complete anonymity, does not begin with Mabuse. Evil conspiracies abound in Victorian literature, not least its melodramas. The Criminal Mastermind was quite commonly a leading series character in early crime fiction. One root inspiration for crime fiction as it developed in the 19th century was Eugène François Vidocq (1775-1857), a notorious thief with a penchant for disguise who in later respectability founded the Sûreté. Vidocq’s adventures on both sides of the law were depicted (in embellished fashion) in a ghost-written memoir published in 1828. Both Vidocq and his book were a notable influence on criminology (he is considered the father of that field), and on fiction, both melodramas like Les Miserables and early crime fiction’s heroes and antiheroes. Vidocq’s activities as a detective inspired Poe’s C. Auguste Dupin stories, Emile Gaboriau’s M. Lecoq character, and others; but so did his activities as a master thief, a clear inspiration on Pierre Alexis Ponson du Terrail’s Rocambole, Maurice Leblanc’s Arsène Lupin and E.W. Hornung’s A.J. Raffles. While both Raffles and Lupin ply their trade for the forces of good as often as for personal gain, early Rocambole novels have the character as more purely villainous; only in later stories does Rocambole become a do-gooder. Raffles and, particularly (in my reading), Lupin tend towards a degree of ambiguity: it’s never entirely clear what side of the angels Lupin is on in a given story. Certainly it’s not easy to predict in advance of reading the ending, often rendering him a decidedly ambiguous character. In this, he clearly anticipates the persistent (so-far) ambivalence of The Blacklist toward Raymond Reddington. That said, there’s always an appeal to the gentleman-thief either way, partly based on their charm. But there’s another thing, one that has persisted in heist and con movies: the pleasure of seeing someone do their job very, very well. These, too, play into Reddington, a man of culture and charm who is also improbably gifted as a spy. 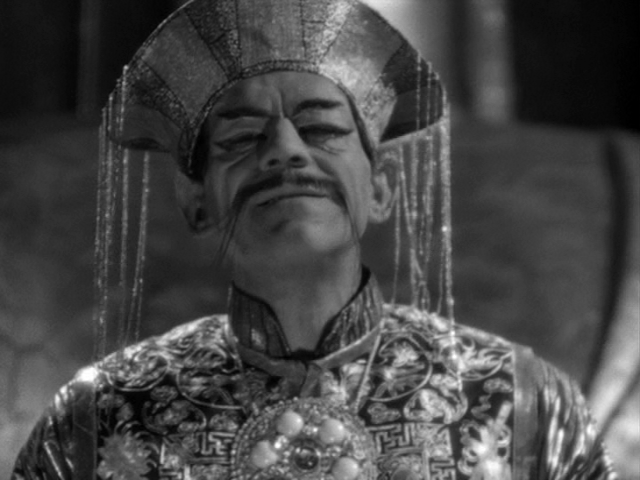 Mabuse himself has three particularly vivid and immediate ancestors: Dr. James Moriarty, Fantômas, and Fu Manchu. Moriarty, Arthur Conan Doyle’s “Napoleon of Crime,” was inspired by another 19th century master criminal, a thief named Adam Worth (detailed in Ben Macintyre’s book The Napoleon of Crime). Despite only appearing in a few Conan Doyle stories, Moriarty is by far Sherlock Holmes’ most famous antagonist, because he is Holmes’ opposite number, a genius fit to match wits with a genius. Right through to Reddington, genius-level intellect is a fundamental requirement of a Master Criminal. Like Mabuse, Moriarty controls a vast, shadowy criminal empire, pulling strings from behind the scenes. In that he plans and brokers illegal activity for others, he is clearly a direct forefather of Reddington, dubbed in the Blacklist pilot “the Concierge of Crime.” Moriarty is very much a figure of late 19th century melodrama, and there are plenty of ways to read the narrative conventions there with regard to the experience of an oppressive world out of one’s control. There’s no clear social subtext beyond this, though, unlike the cases of Fu Manchu and Mabuse, both of whom were invented to speak to specific historical events at the time of their writing. 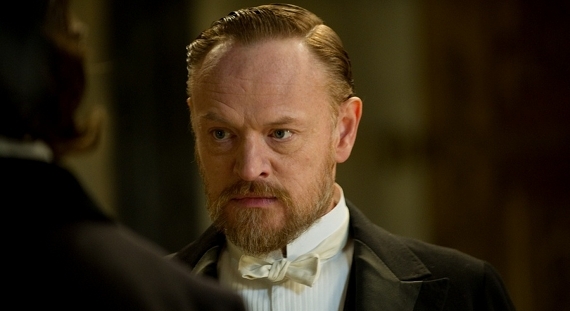 Unlike them, too, Moriarty is not interested in shaping geopolitics or the economies of nations; at one point Holmes tells Watson that Moriarty “might have controlled the destiny of nations,” as the villain’s intellect is so vast, but thanks to a defect in his character, opted for crime instead. It’s not until A Game of Shadows that we see a Moriarty attempting to become not the Napoleon of crime, but rather a Napoleon full stop- a telling difference that speaks to the pressures on filmmakers to raise the stakes in a post-Bond mediasphere. That said, even on the page Moriarty is a core case of conspiracy thinking: through him, all crime in the capitol is interconnected in a vast web unperceived by the general public. It should also be remembered that Moriarty is only in a few Holmes stories, and even in them, he’s barely onscreen, a ploy adopted by Rex Stout for Nero Wolfe’s nemesis, Arnold Zeck. In this sense, one must ask why Moriarty has such an inflated reputation in the Holmesverse: why is he so infamous when his page-time in the Holmes stories is relatively limited? Perhaps this speaks to the modern/postmodern taste for the supervillain, the resonance of the concept in light of social experience. Fandom’s demand for Moriarty is one reason why producers of new Holmes iterations showcase the character. Indeed, until a Moriarty shows up, the work of any Holmes update is incomplete, and viewers stay on alert for indications of his presence (consider the way that the first episode of Sherlock, “A Study in Pink,” uses Mycroft as a red herring for Moriarty- only to point to an actual Moriarty at the end). 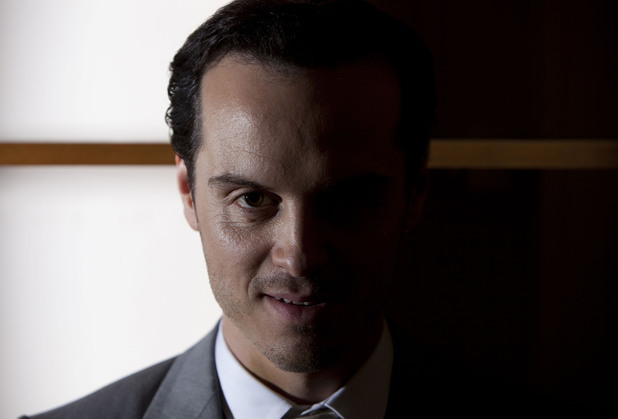 Andrew Scott as Jim Moriarty in Sherlock. Like Moriarty, Fantômas is a murderous sociopath, possessed of none of the overtly redeeming or appealing features of Raffles or Lupin. With the Fantômas series (1911-1913, and carried on by Allain as late as 1963), Marcel Allain and Pierre Souvestre made the titular Evil Genius the central character, the engine powering the series, even if in terms of page-time he was outstripped by his nemesis, Inspector Juve. As with Moriarty, the mystique, the sense of the character’s omnipotence (and omniscience, and at times seeming-omnipresence) is enhanced by keeping him off-stage most of the time, yet in control nearly all of the time. Still, as the main character, he’s a far more powerful and present figure than the literary Moriarty. In Allain and Souvestre, Fantômas is a force of chaos, in this way taken by critics as a symbol of the convulsions attending the dawning of modernity. He’s an attendant at the Shock of the New: the world of Fantômas is one of disguises, alter-egos, hidden compartments and passageways, one where evildoers are always afoot, and where danger can erupt in the most benign places quite unexpectedly. 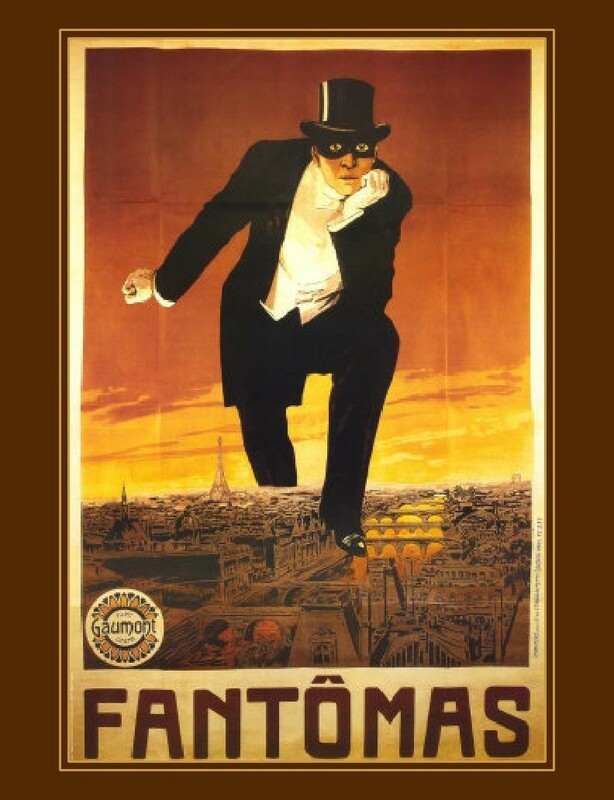 For this reason, Fantômas became a kind of anti-hero to European modernists, the Surrealists in particular. These properties carried over from the literary Fantômas to Louis Feuillade’s serial adaptation, then to subsequent Feuillade serials like Les Vampires, in which at any moment, say, a trap-door in a Parisian apartment could open to reveal a cannon which might fire on a theater in the middle of an evening’s performance. With the Master Criminal pulling the strings on this world, anything can happen at anytime to anyone, and there is nothing the forces of Law and Order can do to prevent it. 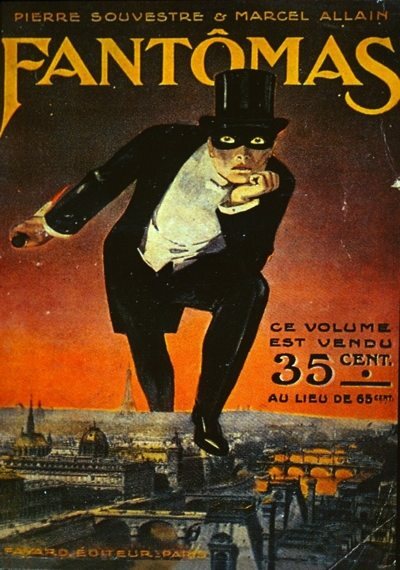 The famous image of Fantômas astride the Parisian skyline- first appearing for the literary version but adopted for Feuillade’s serial as well- is emblematic for exactly this reason: Fantômas, and the paranoia he induces in Juve and his other opponents, is a personification of the zeitgeist, standing in for the unseen forces of the modern (urban) landscape. 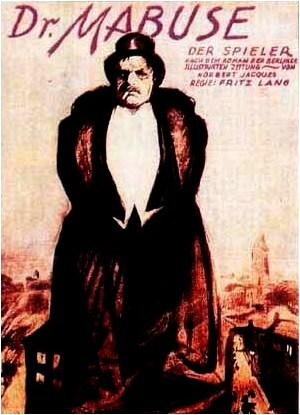 This is why it is entirely fitting that the poster image for Lang’s 1922 Dr. Mabuse der Spieler should be a blatant copy of that image. Like both Moriarty and Fantômas, Fu Manchu is a figure characterized by his seeming omnipotence. He’s a master criminal who devises elaborate plans carried out with ruthless precision by underlings (it must be noted that Fantômas is rather more self-reliant; in that and in his penchant for disguise, the DNA of the Gentleman Thief remains just perceptible). Where Moriarty is content with profiting off criminal activity conducted in a shadowy underworld underpinning the everyday one, Fu Manchu wants to RULE THE WORLD! By comparison with the comparatively inscrutable Fantômas, Fu Manchu’s megalomania is therefore even more anticipatory of the later Bond villain (and comic-book supervillain). It makes sense, then, that the character, racism intact, would appear on screen both in the 1930s (which saw Hollywood appropriate pretty much every series character in detective fiction to “feed the maw of exhibition,” as Tino Balio might say) and in the mid-1960s, after the initial success of the Bond series. Fu Manchu is rarely read today, and in the literature on crime fiction, his significance is seen in symptomatic terms. Sax Rohmer invented the character in a period in which China was assuming greater geo-political and economic importance; therefore, Fu Manchu stands in for a Western fear of the Rise of the East. Likewise rarely read today (indeed much less so than Rohmer, which has just been reprinted by Titan in the UK, whereas I can find no English-language version of Dr. Mabuse), Norbert Jacques’ Dr. Mabuse was instead an overt critical commentary on economic and social conditions in early Weimar Germany. For Jacques, Mabuse was a way to explore fears of decadence and financial manipulation (gaming the system) in the Germany of the early 1920s, an era in which Germany was stuck in economic chaos. Not having read Jacques, I can add little to Kalat’s interpretation of his first novel, Dr. Mabuse der Spieler. For Fritz Lang, though, over time Mabuse took on a larger, less immediately topical significance. In his truly magisterial The Films of Fritz Lang: Allegories of Vision and Modernity, Tom Gunning argues that Mabuse becomes a symbol of the exercise of power in modernity itself: manipulation, deception, surveillance, and systems of control. The Mabuse narratives are readable as allegories of power and powerlessness, the sense that the world is controlled by shadowy but decisive forces, and that the rest of us are trapped in it as if by cogs in a machine (this is the modern sense of the Destiny-Machine, Gunning’s master term for Lang’s concerns, that oft-noted sense of “fate” as a force in his world). Again and again, we see Mabuse pulling the strings on cataclysms to which the rest of us are bystanders, victims or patsies; but also pulling the strings on the everyday operations of business and politics. His key tools are the ability to affect the wills of others, and his access to information: knowledge is power for Mabuse. Here we might see Mabuse (and the similar figure of Spione’s Haghi) as a true exemplar of the 20th and 21st century obsession with conspiracy theories (a genealogy we can also trace to Jack the Ripper-following-the-Queen’s-orders theories). If in the Fantômas world, nothing makes sense, in the Mabuse world, everything makes sense- if you understand the logic behind the way the world works, if you are one of the few privileged to understand the real reasons things happen, if you know what those reasons are. 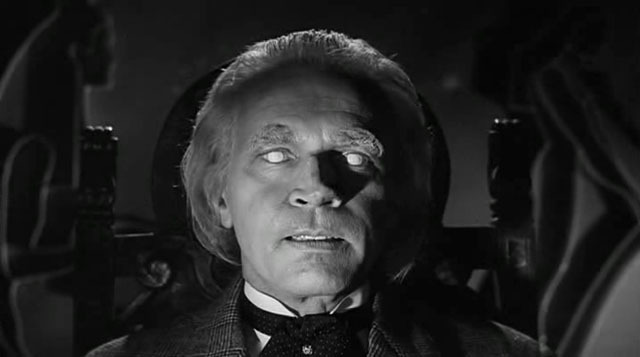 Rudolph Klein-Rogge in The Testament of Dr. Mabuse. In the cinematic Mabuse’s engineering of catastrophes that benefit his interests, we can find a precedent for the most important post-Mabuse non-comic-book Criminal Mastermind: Ernst Stavro Blofeld. For Ian Fleming, Blofeld was a bit Moriarty, a bit Fu Manchu: largely operating behind the scenes, never known to the world outside MI6 and the CIA, but threatening large-scale disasters to extort massive amounts of money for SPECTRE. And a bit Fantômas and Mabuse: both the literary and cinematic iterations of Blofeld make use of disguise (in the books, in OHMSS and YOLT, in the movies in OHMSS and DAF). Like Moriarty but unlike Mabuse, there’s no sense of Blofeld controlling the normal run of events. Blofeld is strictly a criminal, his schemes playing out as elaborate heists ending in extortion attempts. The cinematic Blofeld, in particular, is more visible than Moriarty; if in Thunderball, he is merely glimpsed, in You Only Live Twice, On Her Majesty’s Secret Service, and Diamonds Are Forever, he is a hands-on leader in a way Moriarty never was. Indeed, and I think interestingly in the context of issues of power and conspiracy, it is precisely when and as a result of his direct involvement in events in the latter 3 films that Blofeld becomes vulnerable to Bond’s efforts to put a stop to him, while in Thunderball he is distant and untouchable. Blofeld emerges late-ish in the Bond books, after Fleming has spent most of the series featuring the KGB as the principal villains. In the movies, SPECTRE comes to the fore right from the get-go, but the revelation of Blofeld isn’t until the 4th film, thus keeping a sense of gradually-unfolding mystery around the organization’s hierarchy. Blofeld is disposed of in Diamonds (more or less; I’m leaving out the opening of For Your Eyes Only) thus opening up an ongoing series of new megalomaniacal villains, many of them intent not on extorting money from world governments, but destroying the world to remake it in their own image (Stromberg in The Spy Who Loved Me, Drax in Moonraker). After the Cold War, the threat of global annihilation fades from the Bond series, and so, gradually, does this particular strain of villain. Once again, the Bond villain becomes someone who threatens a catastrophic, but not necessarily apocalyptic, turn of events for some specific personal gain (consider Elliot Carver (Jonathan Pryce) in Tomorrow Never Dies, looking to expand his share of the media market). With the Daniel Craig reboot comes at least the promise of a new Blofeld, this time perhaps behind the operations of the shadowy QUANTUM, the string-pullers in Casino Royale and Quantum of Solace. Blofeld is the one truly iconic villain in the Bond series, so fans like myself keenly anticipate his return to the series, much as Holmes fans await each new Moriarty and superhero comic fans anticipate favorite series villains in film adaptations. It is, of course, in the comic book supervillain that we see the greatest profusion of Master Criminals in contemporary media, and many of them line up with their forebears rather nicely. Lex Luthor, for instance, is a kind of Mabuse figure (the 1920s Mabuse): a public personage, but one who also, covertly, conceives and executes criminal schemes for his personal gain. The Joker, by contrast, is more of a Fantômas, a refinement of what the Surrealists loved about the character: where Lex Luthor manipulates events to gain power and wealth, the Joker is a kind of inexplicable force of chaos. This side of the Joker was even more dominant in the most recent live-action version, in Christopher Nolan’s The Dark Knight. Superhero comics, by their very nature as a form of myth, liberally partake of metaphor and allegory, and are amongst the last places in contemporary fiction where the Master Criminal happily resides. In more self-consciously realist fiction- literary, cinematic, and televisual- the Master Criminal has become a much less central symbol of power and control in modernity and postmodernity. From the early 1970s conspiracy thriller on, criminal conspiracies have webs but no centers, no colorful spiders. Social reality has shifted in ways that make the Mabuse-like Supercriminal obsolete, whether the mysteries of the JFK assassination or the muddy chain of evidence and clown-car profusion of bureaucrats that was Watergate. In contemporary media, the larger scale the conspiracy- be it political assassination or any other form of global power-grab- the more likely is it that the Master Criminal is replaced by a villainous collective. Too, the more realist the fiction, the more likely that the lines between the villainous collective and the Establishment are blurred. From The Parallax View to The X-Files to Alias, the villains are either invisible, explicitly represented in the fiction by mere underlings, or are groups of old white men representing diverse corporate and state interests and presented in low-key lighting. These are not Villains perverting the System, they are the System. The difficulty in naming A villain in the Bourne films (films overtly positioned as Bond revisions) is a case in point. But this is true of science-fiction, as well: in Lost, Battlestar Galactica, and Fringe, there are conspiracies afoot, but they are engaged in by collective antagonists with shared goals. If this is the contemporary norm, then The Blacklist is on one level a decidedly retro show. At the very least, Raymond Reddington is not just a retro character, he’s practically an anachronism in some ways. Yet how the show negotiates Reddington’s status within still larger schemes- circles within circles- makes it a very contemporary show, as well as one with indelible ties to the fictions concerning Herr Doktor Mabuse. Are there spoilers ahead, you ask? Yes, indeed there are, but I’m pretty vague about them. 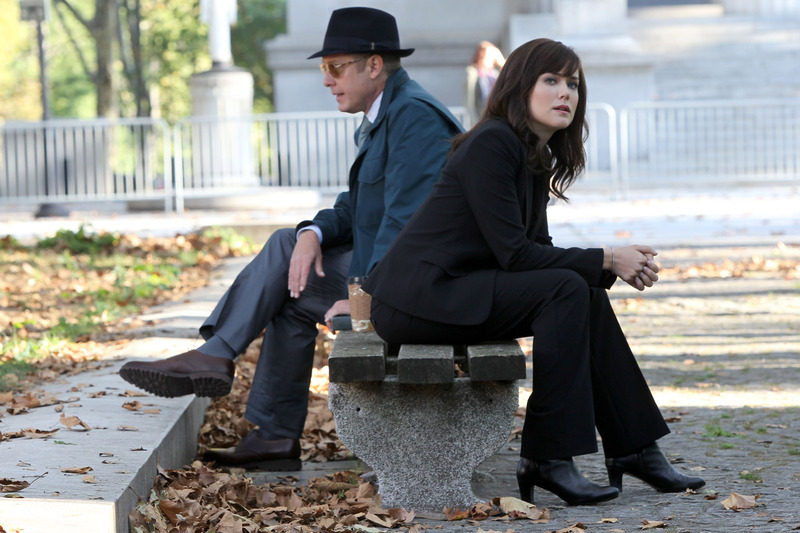 The Blacklist is built around the Clarice/Lector dynamic between FBI agent Elizabeth Keen and a new “asset” named Raymond Reddington. Reddington is a former spy who went rogue and refashioned himself as a Master Criminal, in fact a “consulting criminal” along the lines of Moriarty: he facilitates, he plans, he brokers deals, he provides goods and services in the support of larger schemes executed by (seemingly) still-worse criminals. Thus, he is “the Concierge of Crime.” This is a show without a Holmes, though (Keen is bright, but no genius, and Reddington is not a sworn enemy), and one that centers on Reddington, rather as if Arvin Sloane, played by Ron Rifkin, had been the outright male lead of Alias. If his centrality to the fiction is more Mabuse than Moriarty (leaving aside the specifics of job descriptions now), then so too is the way his power depends on his ability to manipulate people and situations to his own interests. At the start of the pilot, Reddington turns himself in, but does so in order to help the FBI catch a terrorist posing an urgent threat. Reddington seems to want the terrorist to be caught for his own reasons, despite having facilitated the terrorist’s entry into the country, and despite the latter having carried out at least one request for Reddington once in the US. The case successfully resolved, he proposes an ongoing arrangement: in exchange for immunity, he will help the FBI catch all the names on his “blacklist,” a list of horrible criminals whose crimes go undetected because the government doesn’t even know they exist. His one proviso is that he will only communicate with Keen. It is clear that for Reddington this is all for his own interests: but how? For various reasons, more and less obvious, Reddington is a moving target. He’s the main character in a show that mixes serial and procedural plots concerning catching the names on the Blacklist. As it’s an ongoing show, it behooves the producers not to settle certain questions about Reddington and his motives. Why is a Master Criminal aiding and abetting law enforcement? What does he get out of this? What are his ultimate aims, and are they good or bad? Is he a hero or a villain? Certainly he’s outwardly a villain, but perhaps he’s been undercover all these years? Why is he so interested in Liz Keen? While he is clearly executing a large-scale, long-term plan, what is the nature of that plan? Since the enigma of the show is the enigma of Reddington, the show has to postpone drawing conclusions about him. In some episodes, he is merely a particularly ruthless hero (consider “The Stewmaker”), but after a run of these, recent episodes have emphasized his amorality and brutality, his proclivity for sociopathic violence. At the exact same time, though, producers have indicated that there is another conspiracy going on here, one that involves Reddington but that he himself is only a small part of, perhaps is a victim of, and one that presumably (though not yet certainly) represents a threat more malignant than Reddington himself. 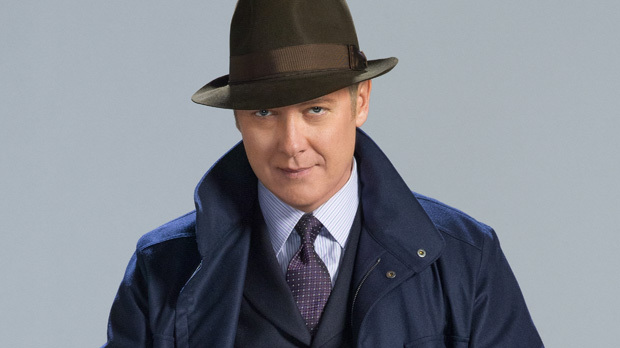 In much the same way, of course, Reddington is partly redeemed on a weekly basis by contrasting him with the names on the Blacklist, all of whom are far scarier than he is, and a lot less charming. So what we have here is a Moriarty-by-way-of-Mabuse leading character of a major network TV show. An evil genius involved in seemingly every large-scale criminal activity in the northern hemisphere. A spider in the middle of a web. Raymond Reddington pulls strings on events to benefit himself in various ways, ruthlessly and amorally exercising his power through manipulation and information exchange (using blackmail, extortion, charm, persuasiveness), pursuing an unknown goal. He is a Super Spy Evil Genius. That the character is who he is, all while being smart and appealing yet sinister, and most of the time in a costume, is the chief pleasure of the show. Reddington is a clear example of a contemporary Mabuse, then; in fact, the clearest. And his world is a Mabuse-ian world. It’s another world where anything can happen at any time, none of it good. A father and son playing catch in a park can be interrupted by falling wreckage, killing them horribly. That nice man you were talking to on the subway can turn out to be a mass-murderer who kills you and everyone else on the car. He also lives in a world where everyday events are the result of sinister machination. On the one hand, Reddington stands in as a contemporary Mabuse-like iteration of conspiracy theory-dom, the conviction that there is a hidden and malevolent pattern to events (the criminal, the corporate, the political), indeed the Langian conviction that power is a Destiny-Machine that swallows us all. Because he is an individual figure controlling events, he is on one level a relic of an earlier phase in Western culture, one in which this sort of fear plausibly could be centered on a single malign person. 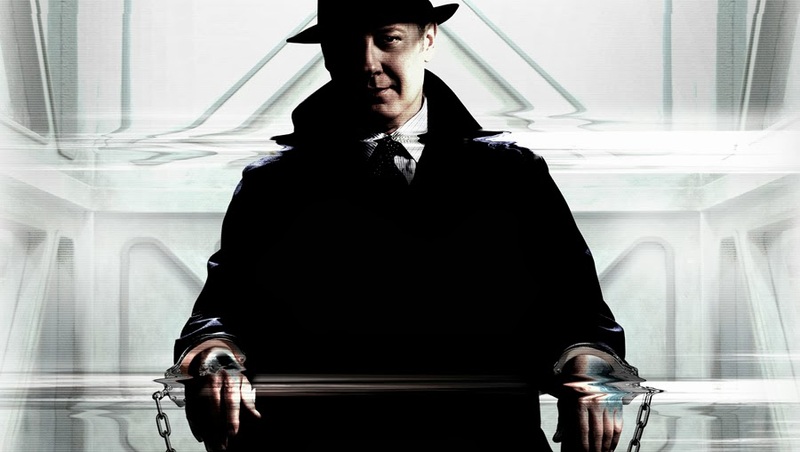 But on the other hand, on The Blacklist, Reddington himself is seen to be merely one cog in yet another machine- a machine controlled by a faceless and nameless cabal (though personified by one of the most iconic actors in all of television, which is another interesting point of tension) that appears to be either within or synonymous with the American government. Reddington’s world is also one where everything, from the activities of the state to the flow of commerce, is controlled by shadowy figures. This is a paranoia which the show both counteracts by giving faces to some, the names on the Blacklist, and reinforces by continuing to open out its conspiracies. He is quite literally a Mabuse/Moriarty in a Ludlam-informed post-9/11 world, and it is here that The Blacklist works to position the Super Criminal in relation to a cultural representation of power based on a more current understanding of The System, its fundamental malevolence, and it the way it controls everything and everyone. That may produce some aesthetic dissonance (two worlds colliding and all), but it’s also how The Blacklist negotiates its place in contemporary culture. 1. My thanks to friends of the blog Jake Smith, Bond Expert, and Dorinda Hartmann, Holmes Specialist, for their advice and fact-checking.